When Fabrice Muamba collapsed in front of thousands of spectators at White Hart Lane, medics ran on to the pitch to begin life-saving treatment. The Bolton midfielder was "in effect dead" for 78 minutes after suffering a cardiac arrest during his club's FA Cup tie with Tottenham. Here, four doctors re-live the critical moments as they fought to restart the 23-year-old's heart. "I was watching the game and saw Fabrice collapse. It didn't look like from my view that there was anyone around him. No-one had made contact. "I immediately felt I had to get on to the pitch and grabbed our resuscitation bags and shouted across to the paramedics, Peter Fisher and Wayne Diesel, our head of medical. "He'd already mobilised the paramedics so we ran on to the pitch and Jonathan [Tobin] and I found him face down, with the Bolton physiotherapist Andy Mitchell." "As I was running on to the pitch I was thinking, 'Oh my God, it's Fabrice.' I know his family and consider him a friend. "I wasn't aware that players had gathered round and didn't know that Owen Coyle, the gaffer, had come on." "I am a Spurs fan and I was there with my brothers. We were watching and then the game stopped. 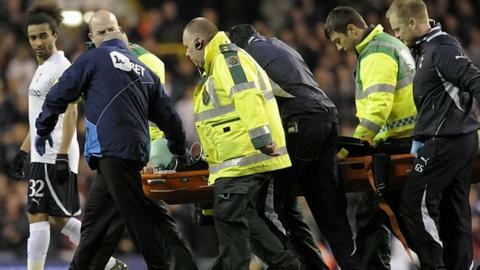 I noticed that Fabrice Muamba had collapsed and I saw people running on and starting CPR. "As soon as I saw that, I turned to my brothers and said 'I should help' and they agreed. I managed to persuade one of the stewards, who we know because we sit in the same place, to take me down. "Going down, there were two young stewards who didn't want to know but an older one let me through when I said I'm a cardiologist. "I could see they were doing very good CPR. They had the defib ready." SM: "We turned him over and he appeared to take a couple of gasps and became unresponsive. Immediately you're focused on the CPR and that training just kicks in. "The chest compressions are helping to pump the blood around the body, the oxygen and the ventilation aims to oxygenate the organs, and the defibrillator is to shock the heart into its normal rhythm. "We do extensive training for this scenario - the worst-case scenario. You have no real awareness of the crowd because you're so focused on the actual resuscitation." JT: "It wasn't until 35,000 voices united to start singing Fabrice Muamba's name that anything from the outside environment penetrated the focus." SM: "The players were very upset." AD: "Very soon after that we decided to take him off the pitch." AD: "He was scooped up by the paramedics and we ran into the tunnel. "I think there was another shock in the tunnel." JT: "He had two shocks on the pitch and one further shock in the tunnel." JT: "Fabrice had, in total, 15 shocks. He had 12 shocks in the ambulance. "There was [paramedic] Peter Fisher, who was maintaining the airway at one end. Andrew was putting in IV access and giving drugs while the ambulance was swaying from side to side at speed. AD: "Throughout the resuscitation period, you are worrying. "You know the longer the resuscitation goes on, the less chance there is of survival. "Jonathan and the paramedic carried on doing the CPR while I got access to two veins. "We had some drugs available and I was able to give those." JT: "I had a paramedic braced against the back of the ambulance and holding my hips because I had my football boots on. "With all of these things you adapt but it was pretty intense all the way through." AD: "We had the London Chest Hospital ready for us. They'd been listening to the match on the radio and had been wondering whether he'd be arriving. "We went straight into the lab and I put a bigger line into a vein under his shoulder blade and quickly scrubbed up. "We got access to arteries and a bigger vein and carried on giving shocks and drugs." JT: "Once we got to the hospital I was no longer part of the hands-on crew and it was when I took a step back that everything that just happened hit me. "I went into the corridor and cried, and then I came back in to watch what these guys were doing. They were phenomenal." AD: "It's very unusual to look after a very fit 23-year-old, who's been playing football for 40 minutes before he collapsed, and having CPR started almost immediately by people who are trained. "All his blood vessels were already dilated and he had all the enzymes that help muscles perform to their absolute optimum, and maybe that protected him. "Something happened that meant he survived." JT: "It was a further 30 minutes in the hospital that they were working on him - without his heart beating and without him breathing. In effect he was dead at that time." AD: "If you are ever going to use the term miraculous, I suppose it could be used here." "We've heard lots of superlatives, I think it's fair to say his outcome has been extraordinary and I'm sure that's because of the extraordinary care he received at White Hart Lane and from the ambulance service. "We've seen some very encouraging signs but we still have to talk about a spectrum of possible outcomes. One of those possible outcomes is a return to normal life. "Almost everybody who comes into us with a cardiac arrest, who has been successfully resuscitated, would be considered for a defibrillator [pacemaker] because they're life-saving devices. "What has happened may happen again and, therefore, if there's any risk you want a safety net."